Thirty people met at Linnaeus University in Sweden for a hackathon initiated by Metsä Wood. The challenge was: how could you construct a property at a specific building site using modular wood? The winning project, “Box”, was an innovative but simple solution based on wooden modules and clever connections. 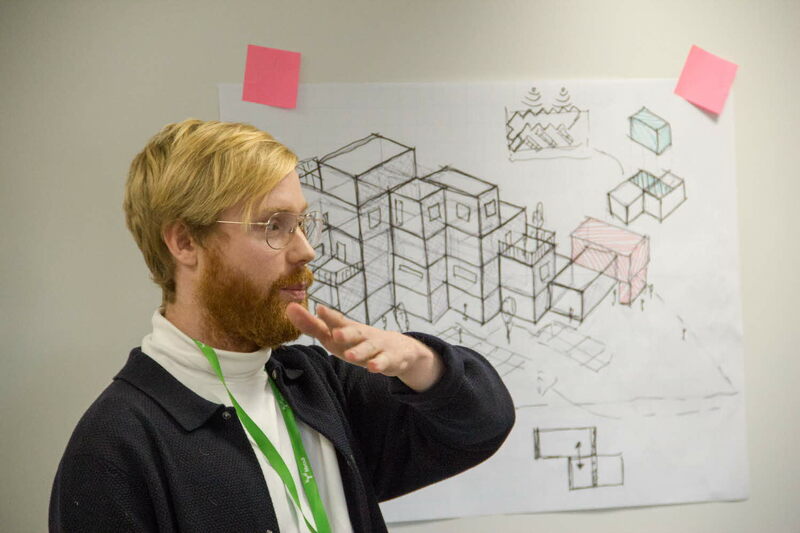 The Open Source Wood Hackathon on October 23 attracted close to thirty architects, researchers, students and wood industry representatives. During an intense day, they had to collaborate as well as compete in creating innovative wooden buildings. The event was initiated by Metsä Wood and organised at Linnaeus University in Växjö, Sweden, in cooperation with the departments of building technology and mechanical engineering, the Smart Housing Småland innovation environment – that work with construction and housing in wood and glass – and Växjö Municipality, one of Europe’s leading municipalities in wood construction. The challenge was, within five hours in groups of five people, to design a building with laminated veneer lumber as a major structural material. The building was to be located at an existing site in Växjö. It should be modular, built off-site and assembled on-site, easy to modify according to use, and also (preferably) relocatable. The winning team called their project “Box”, an innovative but simple solution based on wooden modules and clever connections. “The Open Source Wood Hackathon in Sweden proved again the power of collaboration. The enthusiasm and dedication of both the organising parties and the participants were admirable, and the atmosphere during the day was open and inspiring”, says Tuukka Kyläkallio, business development manager at Metsä Wood. “Our aim is to be a creative part in sustainable social development, so it was self-evident for us to host this hackathon. We have a large network in the building trade through Smart Housing Småland and Växjö Municipality, and collaborate with many actors through various initiatives and projects”, says Tobias Schauerte, senior lecturer at Linnaeus University. It was the third time Metsä Wood arranged a hackathon and the first time in Sweden. The event is part of the company's Open Source Wood initiative, a platform where knowledge about how to construct and build using modular wood is shared under a Creative Commons license. The word hackathon is a combination of hack and marathon, where hack originally refers to programming. The goal of a hackathon is to have a product or solution ready at the end of the event.